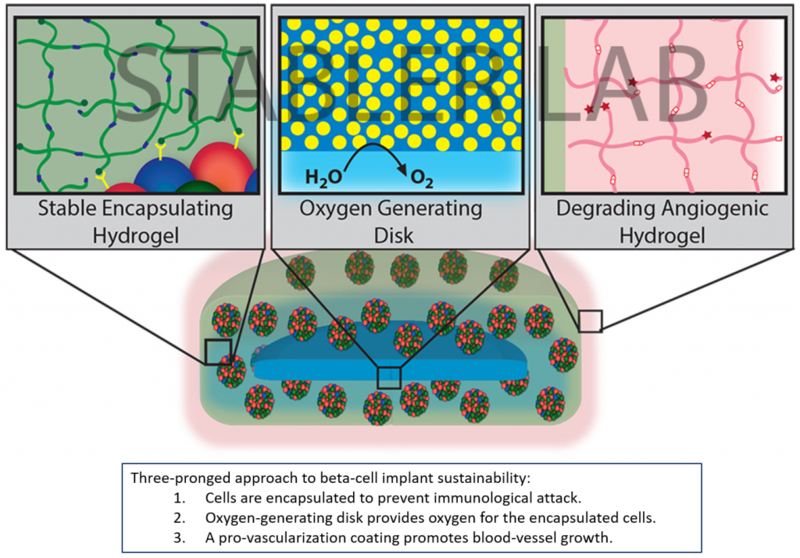 First, islets are encapsulated into a single device using a bio-stable polymer. This type of “immuno-camouflage” prevents immune cells from directly attacking and destroying the foreign cells. Next, because encapsulation decreases oxygen availability, a novel oxygen generating material is placed within the device. Finally, to support the implant long-term, a pro-vascularization coating is placed on the device to promote blood vessel growth at the interface of the implant. This resulting construct is expected to provide a means for the transplantation of islets within a single, confined, encapsulation device that regulates blood glucose levels while eliminating the need for anti-rejection drugs post-transplant.